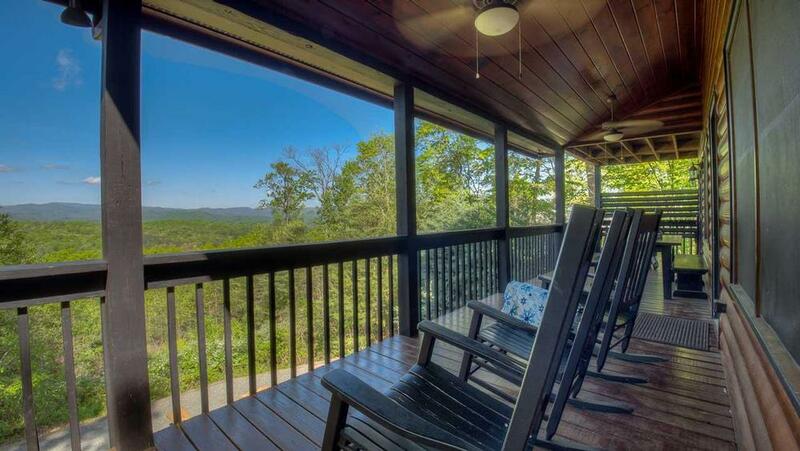 This cabin's name, 'Cohutta Overlook' tells it like it is — this home is perched beautifully on an overlook high above the spectacular Cohutta Wilderness. With more than 40,000 mountainous acres, it is the largest wilderness east of the Mississippi and runs from Fannin County, Georgia up to the Smoky Mountains on the Tennessee/North Carolina border. 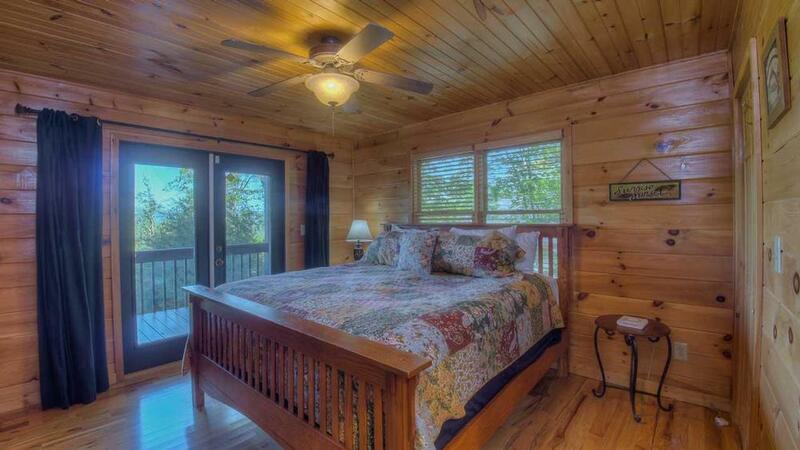 And here, at the Cohutta Overlook lodge you'll be in the distinct position to be above it all. 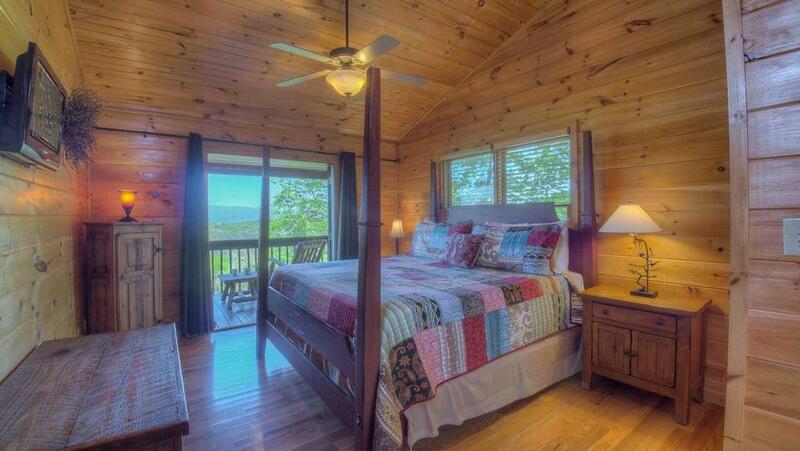 This cozy cabin sits peacefully on the edge of Sunrock Mountain and has panoramic year-round views. Despite the Wilderness it overlooks, this cabin is hardly remote. It's in a convenient location and neighbors are a stone's throw away. 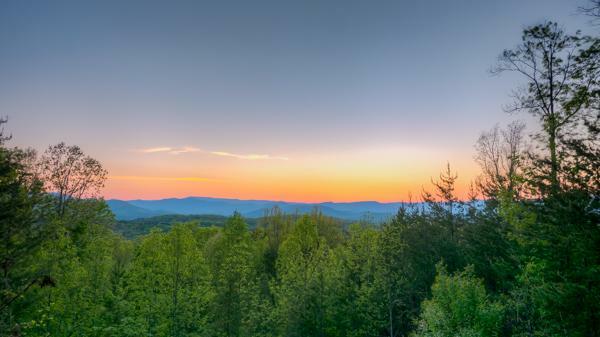 With great accessibility to all of this region's hiking and river activities, it is also minutes from the town of Blue Ridge, the beloved Mercier's Apple Orchards and Copperhill, Tennessee. 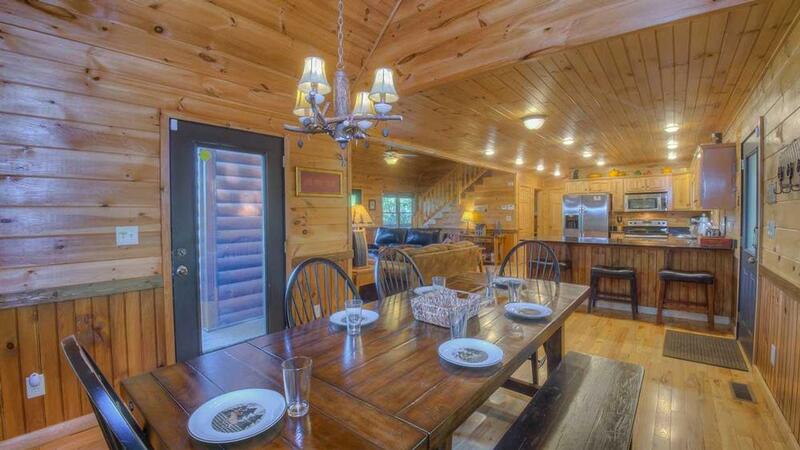 This cabin is decorated in rustic elegance with custom furniture and attention to every detail. 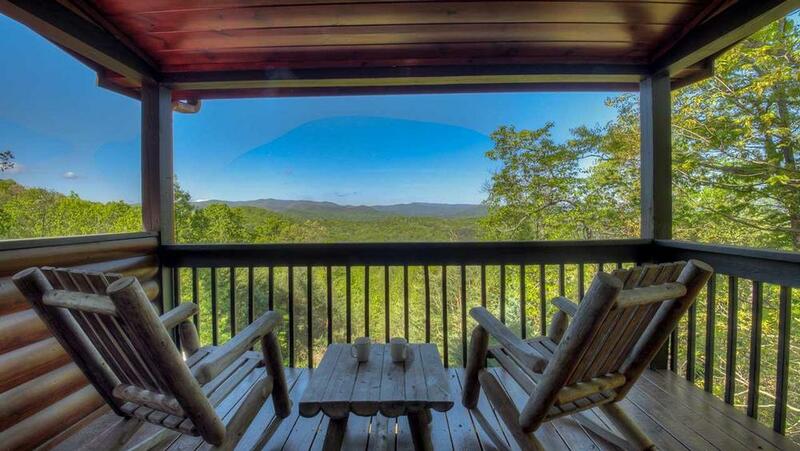 Start your day by enjoying the view overlooking the Cohutta mountain range and witness the flight of eagles and hawks as you sip your morning coffee on the large, open porch. If you are looking for a romantic mountain getaway, enjoy the beautiful spa on the main level and then relax by the stone fire pit or curl up in front of either of the two massive, stone fireplaces inside. 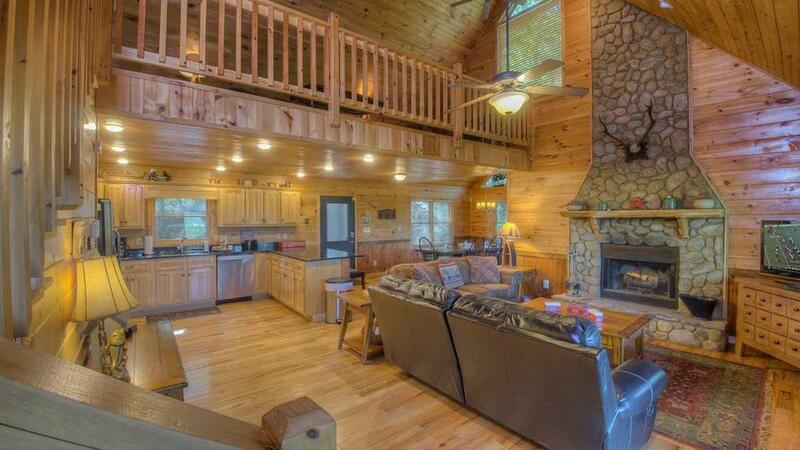 Cohutta Overlook is also a perfect family lodge, with a kitchen big enough for several cooks. Roast marshmallows over a roaring fire or grab the gang for a game of scrabble at the large farmhouse table. If the kids (big or small) are looking for a little competition on a rainy day, the game room downstairs offers Billiards and a Playstation 2 with Guitar Hero as well as a library of board games. 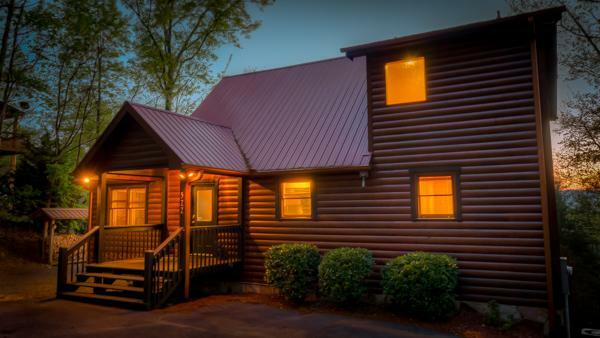 With three bedrooms (two king, one queen and one sleeper sofa); three baths, a reading and sleeping loft, and a huge living area in true lodge style, Cohutta Overlook offers plenty of room for a large group or family. Sleep in serene comfort as every bedroom offers luxury bedding with a comfy pillow top mattress. 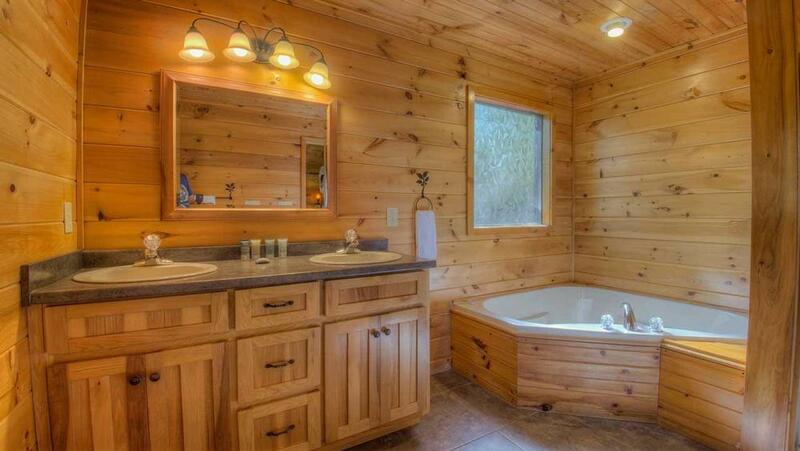 There are ample bathrooms for all guests and the master bath features a garden tub overlooking the lush surroundings. 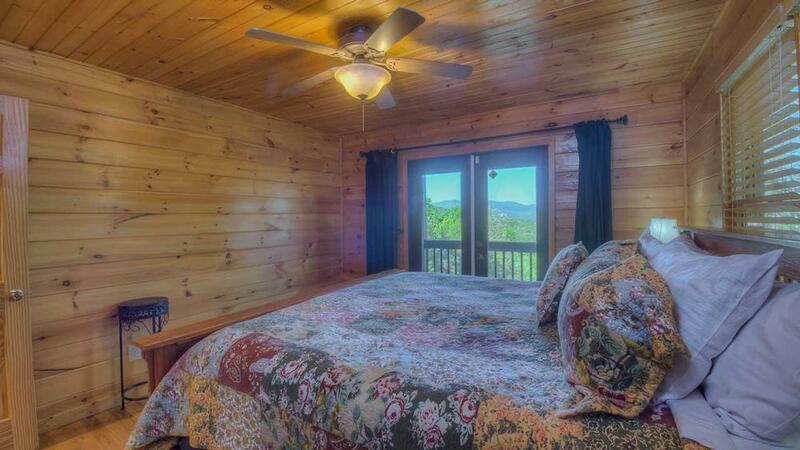 At Cohutta Overlook you can lock yourself away in comfortable, quiet admiration of the wilderness below. 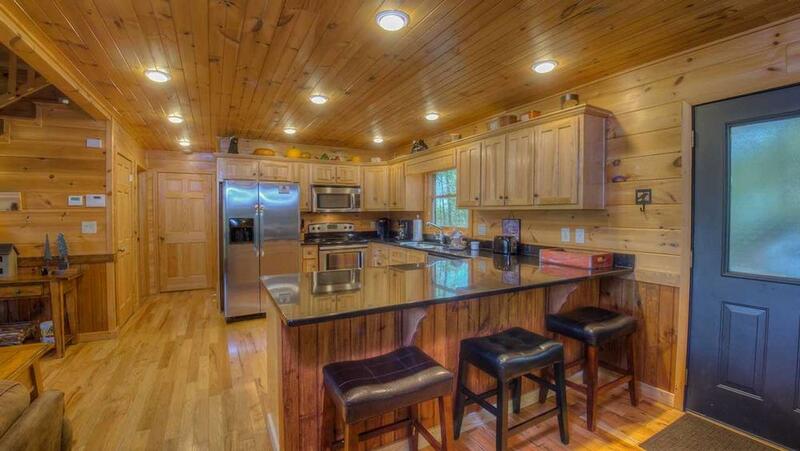 Yet, if an adventure is what invigorates you, then blazon a path on the two acres of wooded land that accompanies this spectacular Blue Ridge Georgia Cabin rental. 11/18 - It's ideal for the 7 of us. We each have enough space. 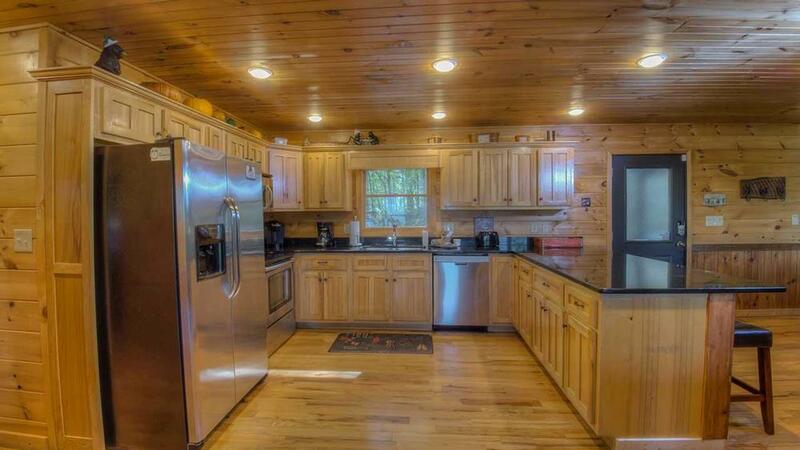 The kitchen is quite adequate. We love the fireplace. Glad you have a Keurig. The view is spectacular. Fabulous sunsets. Your goodie-bag cooler is a nice welcoming gift.You seem to have everything under control. We've stayed with you many times & keep returning to this same fabulous house. (I go with my son). Happy Holidays. Thank you so much. 10/18 - This home had everything we needed for our stay. 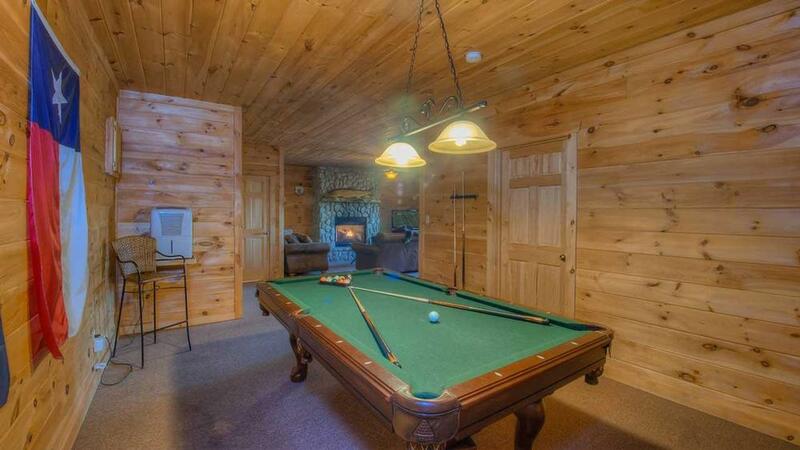 Great Internet service, teens enjoyed the hot tub and pool table. Fire pit was great. We were happy! Your cleaning ladies are great people. Didn't have a need to contact the company while we were there, but Kathy was a lot of help during the process of making the reservation. 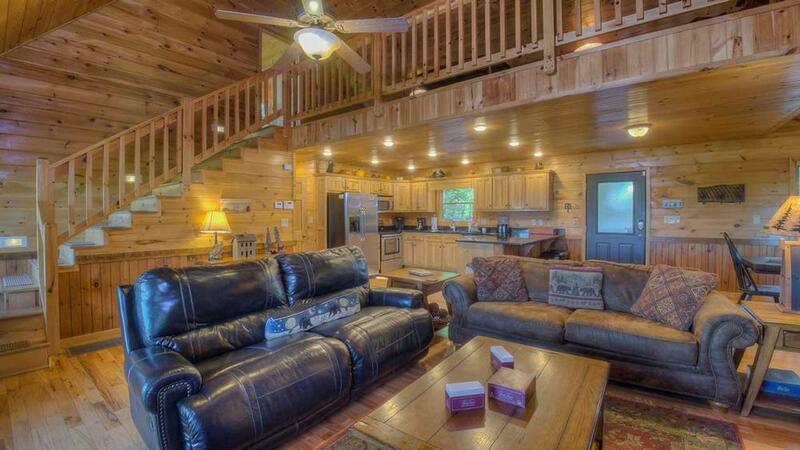 We would love to stay in this cabin again. Wonderful company and so easy to work with! 08/18 - Great view along with a fully equipped kitchen. Very roomy. Company was very helpful in answering any questions or concerns. 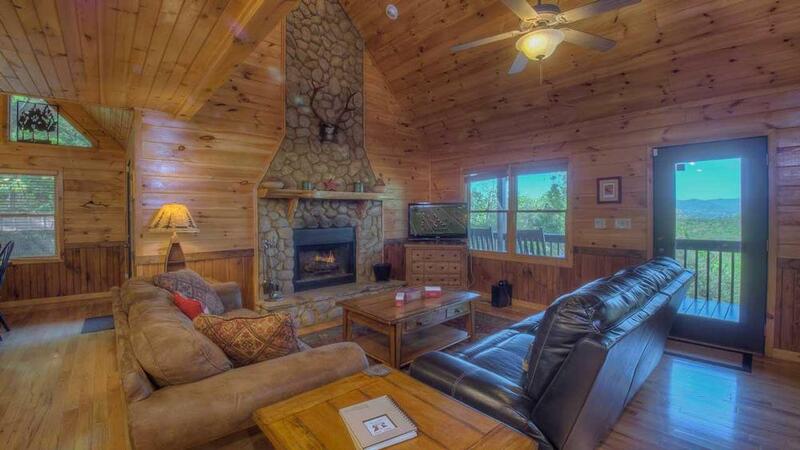 07/18 - Entire cabin had relaxing atmosphere, nice furniture, wonderful fire pit, and great loft area. This is the second time we have booked a cabin with your company. The staff was friendly and professional when helping with our reservation on both occasions. They are eager to answer any questions and email information in a timely fashion. 4/18 - Very, very clean.Very good impression, would definitely recommend them. 2/18 - We enjoyed the space and the view. The company is very easy to work with. 2/18 - Spacious, private, quiet, room to think, clean, organized, everything is where you need it. Great company, professional. 10/17- We really enjoyed the comfy couch and the big screen TV. The kitchen was great for cooking and had all kinds of bowls and utensils and pans that we could use. We used the hot tub a couple of times and that was fantastic. I had no problems whatsoever. I think your company is great! 09/17- Very nice home, great views, well maintained, great attention to detail in preparation for our visit. 09/17- The view was incredible. The cabin was well stocked and had all the comforts of home. The staff was very good to work with, responsive and helpful the entire time. The cabin itself exceeded our expectations and we will definitely be back. 09/17- Location, view, comfort, space. We have used Escape to Blue Ridge several times and have always been pleased. 08/17- It was clean and a very nice house. The views are great and the location was excellent for all the activities we did. We will rent from your company again as we loved the setup and easy way to rent a nice big place. We will try different locations. I like the website. 07/17- Convenient location, easily accessible, great view, nice fire pit, fire wood, hot tub, pool table, fully equipped kitchen, internet, very clean. 07/17- The location was ideal for shopping and close to our family. The sunsets were beautiful and we loved the fire pit and grill. The beds were comfortable, too! Overall, this cabin was spectacular and one we would love to come back to next summer. All interactions I have had with your staff have been exceptional - from the woman that booked the cabin, to the additional calls I made with questions upon our arrival and check out. Everyone took the time to answer all questions thoroughly and professionally. Thank you for a wonderful vacation experience! 04/17- Our cabin, Cohutta Overlook, was absolutely stunning! The cabin itself was every bit as beautiful as the pictures on your website, and our mountain view was as good as it gets. Our only regret was how short our stay was! 04/17- Amazing view, great amenities, and wonderful location make this home a good place to vacation. ETBR is a wonderful company to use when planning a vacation. We are planning on using your services again in the future. 04/17- The view was amazing, the house was not only beautiful but very comfortable, clean and well equipped. Great pillows and bedding. I can see why you have such excellent reviews. Every single contact with your staff was excellent! People were friendly, helpful, enthusiastic, and professional. Loved that there was a light on at the house when we got there. 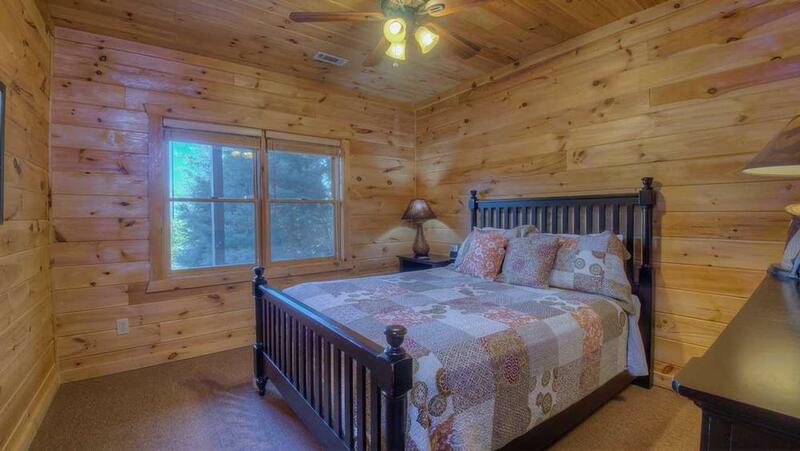 03/17- Great view, wonderful guest rooms and plenty of space. Overall it was great. 03/17- Loved the cabin, nice and comfortable. Close to town for anything you may want or need. The view was by far the best to start & end each day. 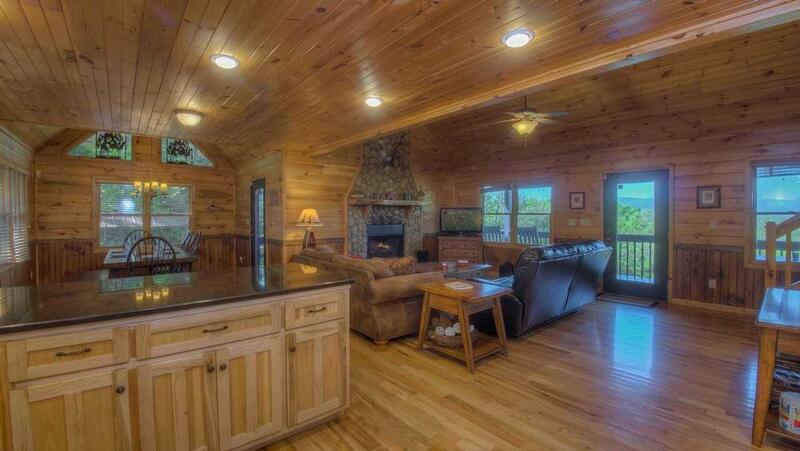 Professional & easy to book... hopefully we can take another family vacation here! 01/17- The attributes I enjoyed most about this home were that the fire pit was very useful, the house was very user-friendly and for anything we had any confusion or worries with they provided the instructions. Your staff were very pleasant, courteous, knowledgeable and professional. This was my 3rd visit with your company and each visit is even better than the last. Thank you for all of your hard work and dedication. 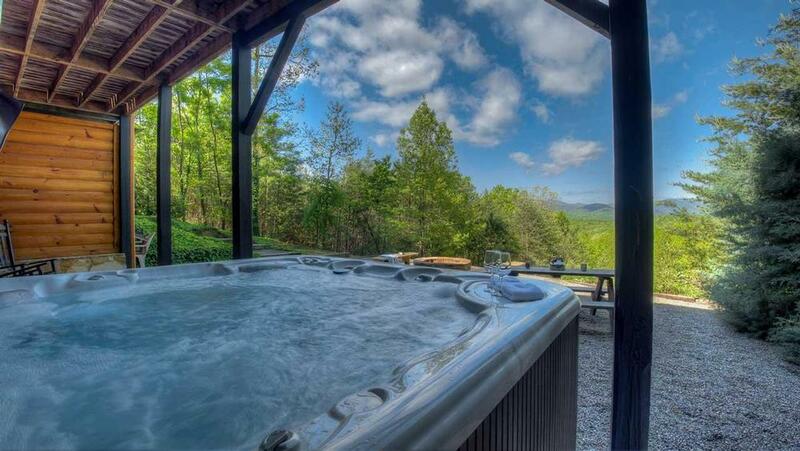 11/16- Wonderful hot tub, great view, comfortable beds. The company is very easy to work with. 10/16- All needed amenities were there, comfortable beds, well furnished, very clean. Easy company to deal with, very thorough and accessible. 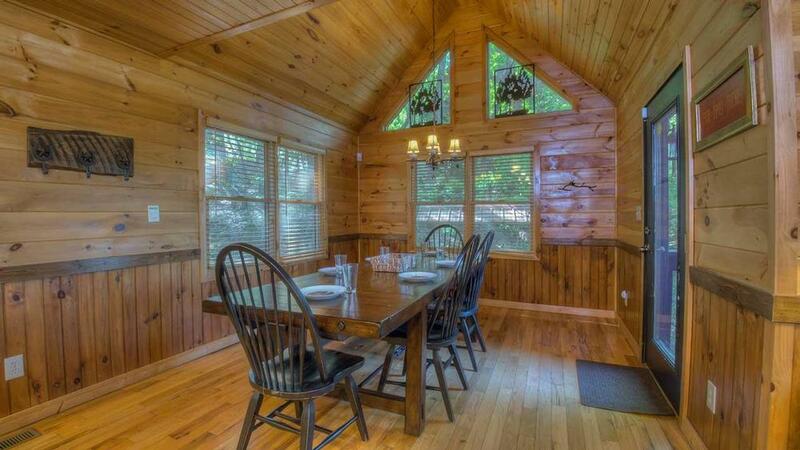 10/16- Enjoyed everything with the process of renting this cabin and our stay at Cohutta Overlook. The process was very easy and assistance was great throughout. Cabin was amazing. Blue Ridge was friendly, helpful and informative throughout the entire process. 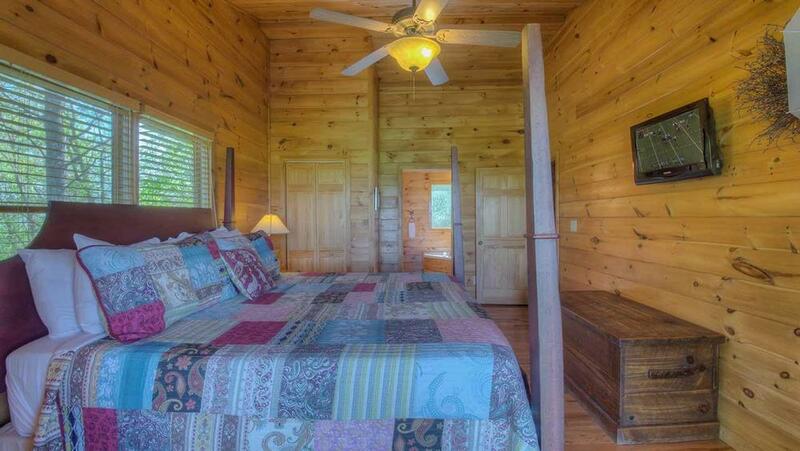 Will be staying with Blue Ridge this coming August and are very excited. 08/16- The view was beautiful and we loved that everyone had on bedrooms and bathrooms..
08/16- The view and the layout of the cabin are great. 08/16- We loved that we were instantly relaxed upon arrival. The porch rockers were visited often, for morning coffee and evenings with a glass of wine --the mountain views were spectacular and the sunsets did not disappoint. The beds were very comfortable and we loved the elegance of the linens and quilts--very nice! It was great having a gas grill on the porch as well! Believe it or not, we did actually use the firepit one summer night to roast s'mores--we couldn't resist--thanks for all of the stocked wood ready to go! Your staff is top notch! I spoke with Christina several evenings to rectify a tv/dvd issue and she did a nice job of troubleshooting the issue over the phone. This is our second time renting from your company, and I really appreciate being able to call your office prior to booking, and get your staff's input and suggestions about each cabin and location. We could relax and enjoy knowing your staff is at the ready! Thank you, EBR, for another great vacation of relaxation and restoration for some weary souls! 08/16- The view was breathtaking! The house felt like our own, because it had all the amenities we needed and more. The beds were SO comfortable and clean, it felt like a 5 star hotel! 07/16- Appreciated the view, cleanliness, and the reservation process. Thank you! 07/16- awesome view... great floorplan and you folks are great! have vacationed many times in one of your cabins...all have been top notch, very clean...always had excellent customer service!! 06/16- Beautiful view and cabin. 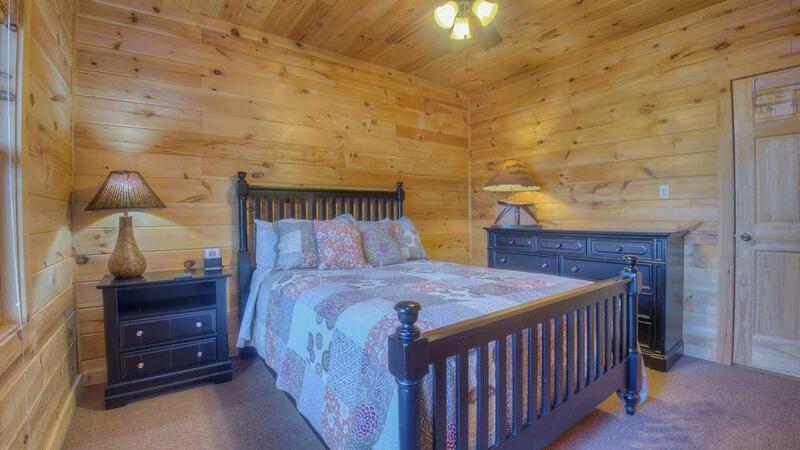 Very clean and well kept and laid out cabin, which has many nice extras in the kitchen as well as.....running lights on stairs, nightlights, separate common area on each floor which would be great when several families/couples rent. 04/16- The cabin was wonderfully arranged and the view was incredible. The fire pit and hot tub were wonderful. Beds were very comfortable. And the wifi was great!, So close to Blue Ridge and the paved roads were appreciated!! I would recommend this cabin if some of the below items were taken care of. Also we were too close to the neighbors but that was our oversite when renting. 04/16- Our family loved the quiet area which the home was located. The home was excellent in terms of size, cleanliness, and location. The directions were spot on and I really enjoyed the area of Blue Ridge. I would definitely come back again. By the way thanks for the supply of firewood!! 03/16- We liked the ease of finding the location. 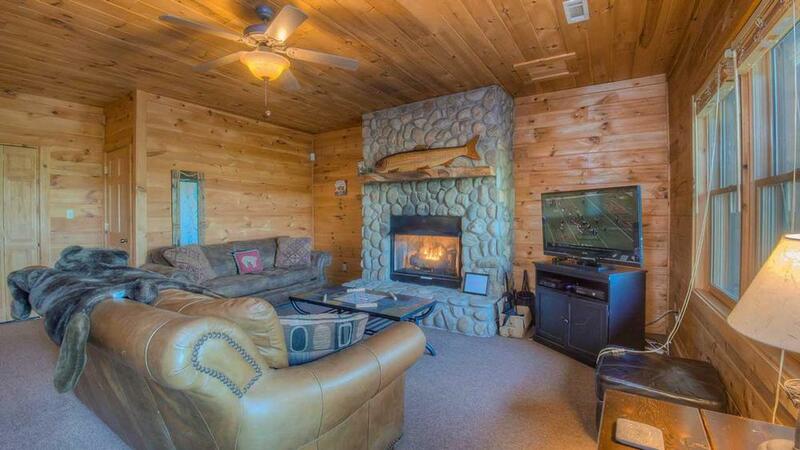 The floor plan was perfect, the remote fire place and the fire pit was a great features. It felt cozy and peaceful. 03/16- The view was amazing! Loved the coziness in the downstairs den. The hot tub was our favorite! The cabin itself was absolutely gorgeous and accommodating. 12/15- Everything we needed is there. 11/15- The view, the fireplace, the privacy offered by the floorplan. We are repeat guests, many times over. Will definitely use you again, hopefully sooner than later! 10/15- The view was fantastic. The accommodations were great. Felt like home. 10/15- Just beautiful! Amazing views, rooms, open kitchen... We've stayed at one other house for you company that was also great but this one was better than the first! 09/15- The gorgeous views from the back porches at the cabin. Each room on each floor having their own bathroom. The space in the cabin. The staff is always very friendly, helpful, and ready to take care of you! We've used this company twice for family vacations and we are already talking about planning our third trip to Blue Ridge! 08/15- The views are amazing! The home was so comfy and perfect for three couples. Perfect vacation - this one will be hard to match. I was impressed with the interaction with everyone I spoke to from the reservation to needing additional gas for the BBQ grill - everyone is so friendly and accommodating. The team really makes you feel like you are the only customer, super important and valued. Outstanding customer service!! 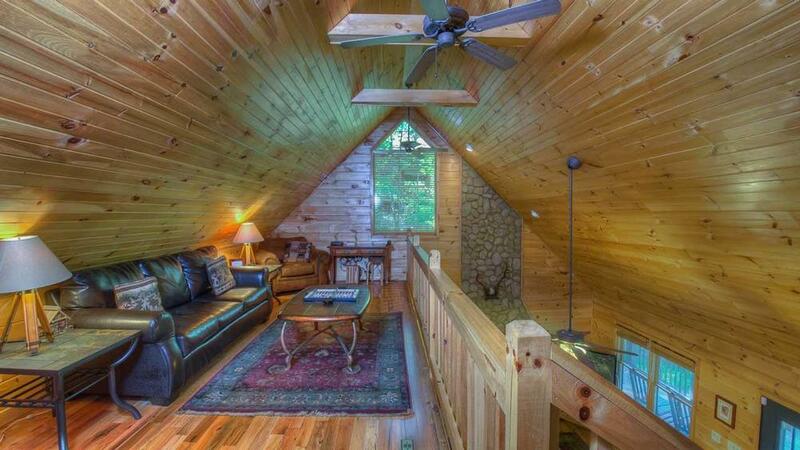 03/15- I frequently rent cabins in Blue Ridge and this was probably the best cabin I've found. The fire pit was perfect. We sat outside all day all 3 days of the trip in front of a raging fire looking at the beautiful view. 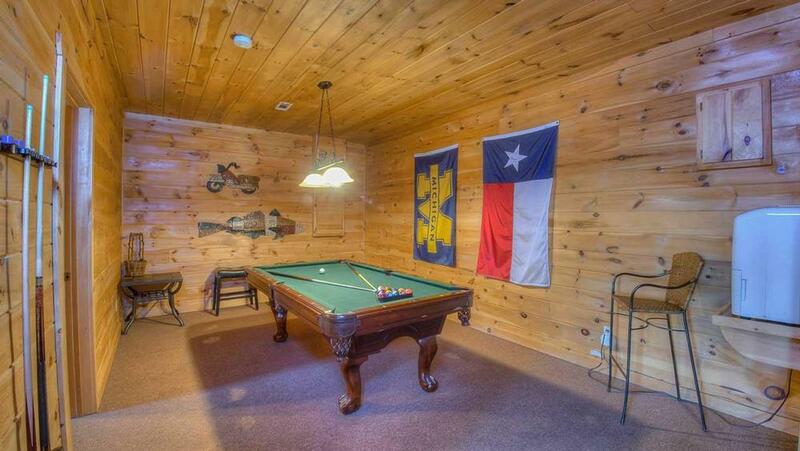 The hot tub and pool table were awesome as well. 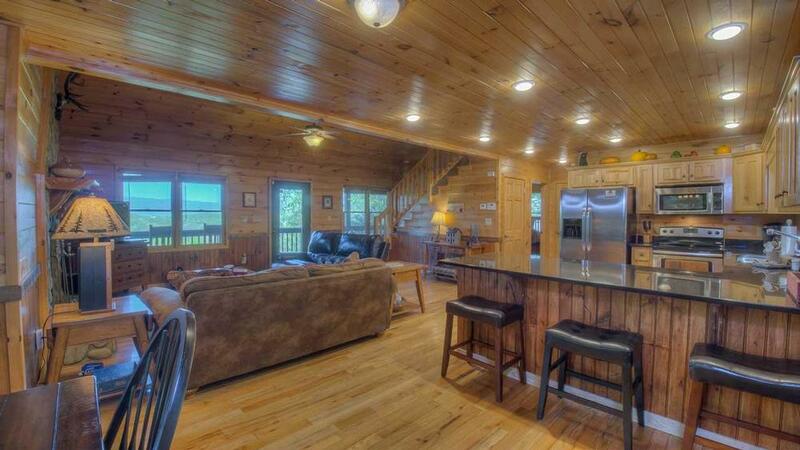 Escape to Blue Ridge is the most professional management company I've dealt with when renting cabins. I always check their availability first as they seem to have the best cabins and they keep them very clean and maintained. 03/15- Back porch, fire pit, hot tub, pool table were all favorites. 03/15- I loved everything about the home! The beds were amazing! 02/15- This home was perfect!! We traveled to this cabin for a couples weekend get away and it was amazing. Not only did the home come fully furnished with everything that would be needed to live, but it came with so many extras! And the hot tub.....easy to use and extremely addictive. They even prepared the shock treatments in individual pre-packaged bags for each use. AMAZING! 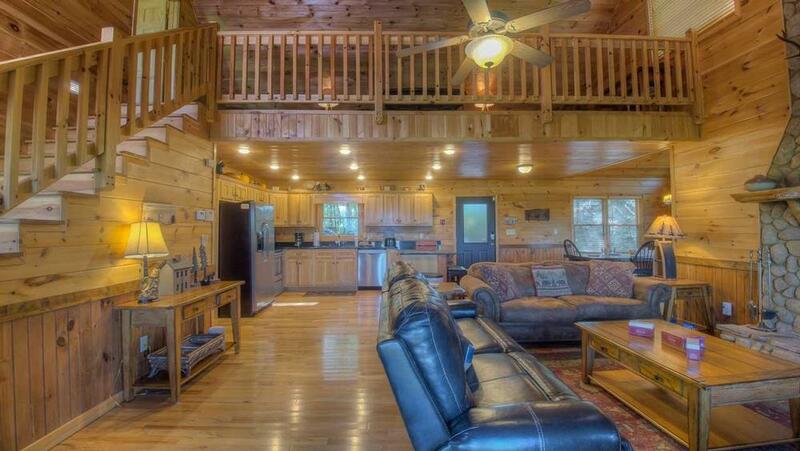 Taking a trip to one of these cabins is WELL WORTH IT. I am planning to take a trip for just myself and my wife in the near future. I would recommend this to all of my friends. 02/15- The view was spectacular, the house was stocked with anything you needed. Usually the kitchens of rentals are scantily stocked, but not this one. Thanks for making us feel welcome. From the moment we began the rental process and even past the trip, Escape to Blue Ridge has been readily available to answer any questions. They provided perfect directions to cabin. 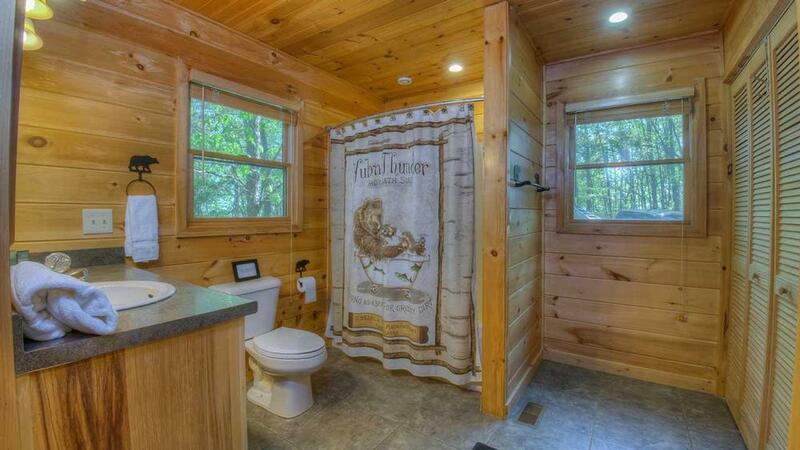 The cabin was exactly (actually better) than described. We have rented from many companies in the mountains before, but Escape to Blue Ridge was our favorite so far. 10/14- The views are great! 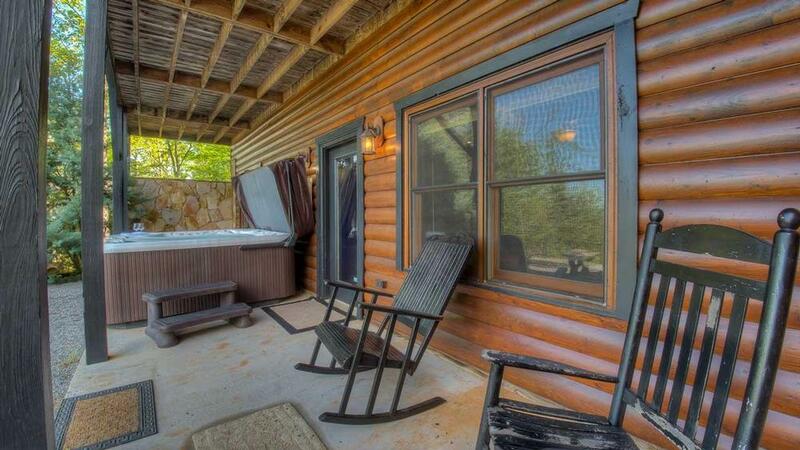 10/14- Wrap-around deck, long-range view, hot tub, cozy decor were great. We've used you 3 times, zero complaints. You are our exclusive and official go-to for our mountain trips. Thanks! 08/14- The view. Sunsets were incredible!! The house was very comfortable for our family. Our girls loved the hot tub and pool table. Again, the sunsets were beyond compare!! 08/14- Cohutta Overlook was not my favorite cabin. The floors squeak so badly on main and upper levels that even a tiptoe can be heard in the middle of the night and awaken the house. It has a nice floor plan and back deck. I enjoyed the trip, but will choose another cabin next time. 07/14- The view and the firepit were our favorite features. 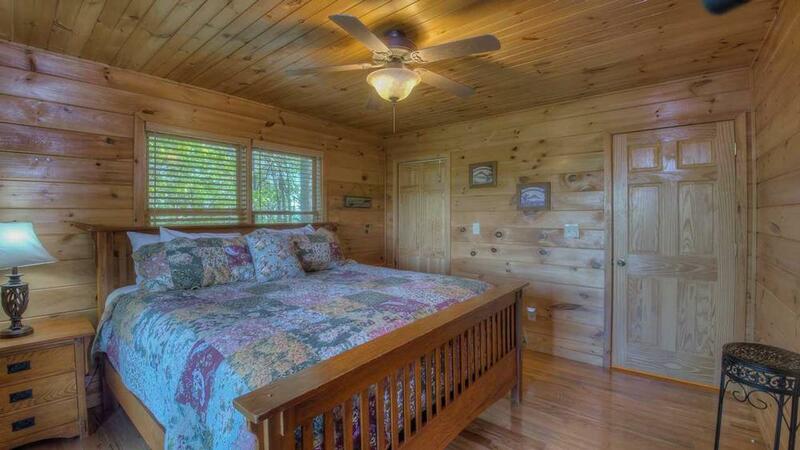 The cabin was very well stocked with extra blankets, pillows, and cleaning supplies. the only thing that would have made our stay better would be improving the road to the cabin. everything else was great! The house is very clean and spacious and the view just doesn't get any better. The sunsets were amazing.